George Gower was born in 1540 and died in 1596. The exact date and place are unknown because during the time of the Tudor and Elizabethen periods there was a lack of birth records!! Where did he spend most of his life? Describe his training. The important parts of George's life were well spent in the royal court as a serjeant painter for Queen Elizabeth. Before he was involved in the royal court, George trained to become a great artist and painted a self portrait. He also painted a portrait of a wealthy English merchant, Sir Thomas Kyston, and his wife, Lady Kyston. This lead to the spread of his reputation which earned him duties for many wealthy clients, nobles and courtiers. George held an honorable position in the royal court for a big chunk of his life. His role kept becoming more important as he kept living up to the Queen's expectations of him. What type of art did he create? Give the names of 3 pieces of his work. George created mostly portraits, miniatures, heraldric emblems and illuminated manuscripts. Some pieces of his work are Portrait of Queen Elizabeth I, Portrait of Sir Henry Neville and Portrait of Thomas Slingsby. George's patrons were Queen Elizabeth, the wealthy and nobles and courtiers. What is the name of this piece and when was it created? The Armada Portrait was created in 1588. Where might you see this piece today? This piece can be found in the long gallery of the Woburn Abbey and Gardens in England. What is so significant about this piece? This piece represents the power of Queen at the time of when she gained a victory over the Spanish Armada. Why do you find this piece so interesting? I think it is interesting how George made such a big picture of the Queen to represent her large amount of power. The painting has a meaning. Describe how the artist portrays an "ism" of the Renaissance. Secularism is portrayed through this painting because it shows political power and displays a prominent public figure. The Queen is shown to be highly honored because she is the main idea of the whole painting. Describe this piece in your own words. I think this piece does a very good job of portraying the importance of a leader. It shows how people should look at a ruler in their role of society. The power is being recognized. Alchin, Linda. "George Gower Facts and Biography." Facts About. Siteseen, 2015. Web. The Armada Portrait. George Gower. 1588. In ARTsor [database online]. [cited 3 December 2015]. Available from ARTsor, Inc., New York, New York. 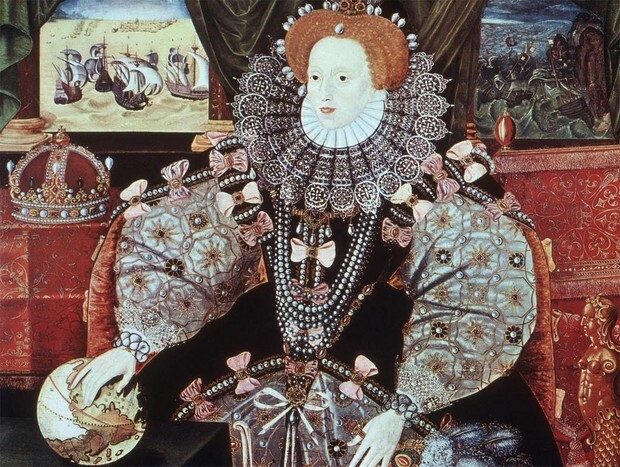 "Queen Elizabeth I." Woburn Abbey and Gardens. Woburn Enterprises, 2014. Web.